Just a slight disclaimer for myself here - yeah I know I don't usually review NA books. I only really read YA. But I saw this on Netgalley, under the Teens & YA category (I don't look under NA). Yes, it was also listed under New Adult, but I figured it couldn't be too bad if it was listed under Teens & YA. And no, it wasn't as bad as I've heard a few of them are. Sure, there were some moments, but it wasn't awful. And even if it was, the story would have made up for it anyway. The characters were amazing. Rory was so great. She's totally me. Except I'm better at English than human biology. So just swap Rory and Tyler's best subjects and you have me. Oh my goodness. Tyler was amazing. He was actually so sweet when you looked past his stereotype. His brother's were fantastic! This book isn't just about a college romance. There are also some dark themes in here, like abuse and a drug-addicted parent. And also a rarer theme - like Tyler's brother who has Down Syndrome. I didn't like it at one particular point near the end, but, thank goodness it changed. Seriously, it could have wrecked the story for me. The romance was amazing. I can't believe I've gone this long without talking about it properly! But yeah, it was so cute, and both characters involved were amazing. They were so devoted to each other and it was just. So. CUTE. Anyway, if you want to try an NA book, then I think I've found you a starting point. 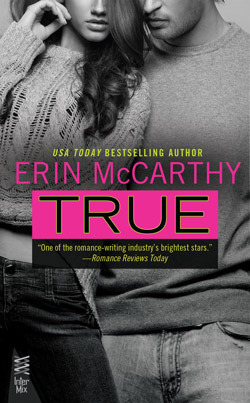 Today and New York Times Bestselling author Erin McCarthy sold her first book in 2002 and has since written almost fifty novels and novellas in teen fiction, new adult, and adult romance. Erin has a special weakness for New Orleans, tattoos, high-heeled boots, beaches and martinis. She lives in Ohio with her family, two grumpy cats and a socially awkward dog.